Browse our calendar to find your desired performance and click on "Buy". If you prefer to order by mail, download, print, and return this form; see our contact information to the right. Box Office hours: Monday thru Friday, 12:00 p.m. - 6:00 p.m. Box Office is open two hours before each performance, including off-site events. Save 20% with a season ticket package. Additional discounts do not apply to season ticket purchases. Click here to browse our series and purchase season tickets. STUDENTS Columbia student tickets are $7 for all performances. All other college students receive a 40% discount. GROUPS Groups of 10 or more may be eligible for special rates; call for details. Student, faculty/staff, young people, and senior discounts are available online; select discounted price during checkout after adding the performance to your cart. Tickets purchased at a discount will be held for pickup at the Miller Theatre Box Office. Valid ID must be presented to retrieve tickets; limit 2 tickets per ID. Discounts apply to events produced by Miller Theatre only. The Miller Theatre Box Office accepts payment by cash, check, American Express, Visa, Discover, or Mastercard. Handling fees apply to online orders; there are no fees for in-person or phone orders. Checks should be made payable to "Miller Theatre at Columbia University." All ticket sales are final; no refunds. Only season tickets may be exchanged. Information on house policies and accessibility is available on our Visit page. The balcony section is located above the rear orchestra. 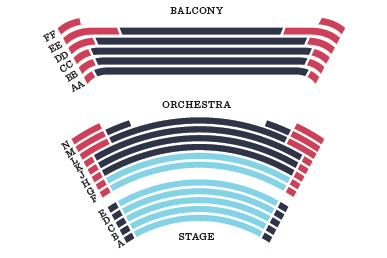 Seating maps for other venues are available in Visit.